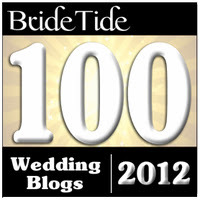 Relentless Bride® Weddings, Wedding Planning, Life & Marriage: Are you a Bridezilla? Wikipedia definition: Bridezilla is defined as "generic term used to describe a difficult, unpleasant, perfectionist bride who leaves aggravated family, friends and bridal vendors in her wake. A bridezilla is obsessed with her wedding as her perfect day and will disregard the feelings of the family, bridesmaids and even her groom in her quest for the perfect wedding." 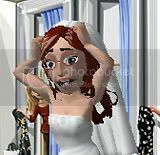 Webster's Definition: Bridezilla\ bride-zil-a n 1 Horrific, bulging-eyed bride prone to screaming spells and spontaneous fits of hysterical rage. Bridezillas are known to drop blows over seating charts, get bug-eyed at the mere mention of carnations and view hurling champagne at their wedding planners as a form of hazing. 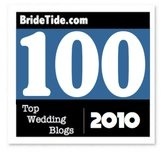 Bridezilla.com's Definition: Bridezilla\bride-zil-a n 1 Exceptionally attractive, confident women who know what they want and can't be bothered to sugar coat because they are obviously on 100 calorie- a- day microbiotic diets and can't even sneak a pack of Splenda if their life depends on it. Bridezillas are both blessed and cursed with a higher vision of perfection than most mediocre, David's Bridal wearing, Gerber daisy carrying mortals and have no choice but to impart this vision exactly to the masses. It is this motive that drives them to demand nothing less than excellence from their staff-err, wedding party. Are you a bridezilla by any of those standards? PS. As noted in the 2nd comment, i wanted to state that none of the definitions above are a reflection of my own, i just found them a bit amusing! I'm not sure why but out of those three definitions I am most offended by the Bridezilla one. I know they have to pimp their site and all, but damn accusing women who wear David's Bridal and wanting to carry daisies as pretty much not being worthy enough to get married is really mean. I was hoping someone would comment on that! LOL It was so extreme I had to include it. If that truly is a bridezilla, I have yet to actually meet one. But maybe that's for that better! There are so many things jacked-up about that show I can't even begin to mention. Mainly, either those girls are all the craziest of crazies- or that crew really knows how edit. I'm guessing a little of both. i agree, probably a little of both. half the time i can't even watch the show because i am either angry by their behavior or embarrassed by it.